On January 17, we were happy to welcome film producer, writer, and director Stu Pollard ’85 back to campus. 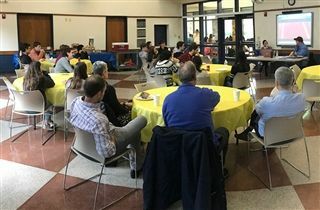 Stu visited campus to speak with Film Club members and other students about the new movie Rust Creek, on which he served as producer. The movie, which is an action/thriller shot in Kentucky, is currently in select theaters and available through most digital rental services. The Courier-Journal ran a story about Stu and about Rust Creek’s Kentucky connections last week. We’d like to thank Stu for sharing his time, talent, and expertise with our students!